Yesterday, I posted a blog on the best performing mutual funds in the last 3 years. The performance of the funds in the last 3 years had been stellar because of the good performance of the markets. Mutual funds, like any other pooled fund are not guaranteed and would most likely reflect how the markets are performing. Due to the credit crisis of 2008, the markets took a heavy beating in the years 2008 and 2009 before seeing some recovery. If you invested in mutual funds (or UITF, VUL) in those years and pulled out your money, you would have lost a significant amount of your investment. However, had you kept your money in the funds, you would have recovered the losses and actually still see good yields. Again, let me reiterate that yields are not your only criteria when choosing an investment as I mentioned in my blog yesterday. But, it would be good to see how the funds are doing and how they fare against each other right? 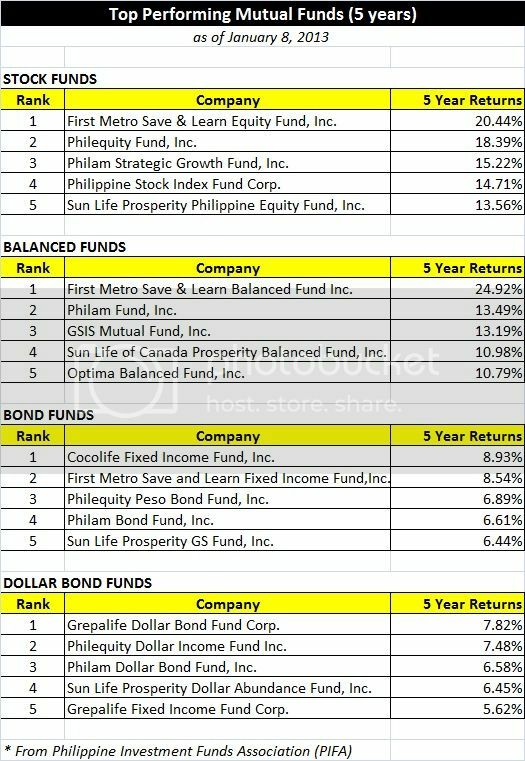 di ata na-edit yung heading ng 3rd column :)… again, i think it would be better to show a yearly performance (in this case, for the last 5 years) so as to “warn” the newbie investors that not every year will result in a positive return/growth.. Corrected the chart. It now reflects 5 years. Apologies.